I spend quite a bit of time on the internet searching for new or interesting tools to share, but I can't find them all. Thankfully Tool-Rank has readers that also send in their finds. 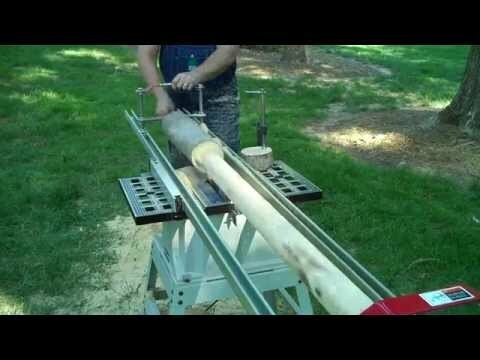 Yesterday a tipster sent in a link to a unique tool that turns your table saw into a lathe of sorts. The tool, called the Cylinder Mill, is sort of like a hand powered lath that uses the blade of the table saw to do all of the cutting. A simple crank mechanism is used to turn the wood by hand, while at the same time you push the jig though the table saw. The height of the blade is what determines the size of the turning, which can range from about 1-inch up to about 12-inches. This is probably not a tool that everyone would find useful, but at $159 is seems like a bargain for those that would. It could be a real time saver for rustic building. New tool cuts up to 9ft cylinders, cones and virtually any size tenon!! Now available at www.cylindermill.com! The Cylinder Mill works with your current table saw to create virtually any size cylinder, tenon or tapered cone from any kind of wood with just one pass through the blade. This is a money and time-saving tool that really is as easy as it looks! We now have a new upgraded version. Find more information on our website, www.cylindermill.com.